The photographs of Jack Delano have been featured before on this blog, and these were the documentary images of and around the railway. This is a slightly different subject matter and style of photography. There are a few different variations of this scene on the Library of Congress website, but this one just works best in my eyes. Maybe it’s the solitary figure walking done the steep icy steps, and the people further down, all heading towards the gargantuan steel mills that dominate the bottom of the valley. As a photograph, I think it needs these people in the photographs, and they need to be small in comparison to the landscape and the steel mill. 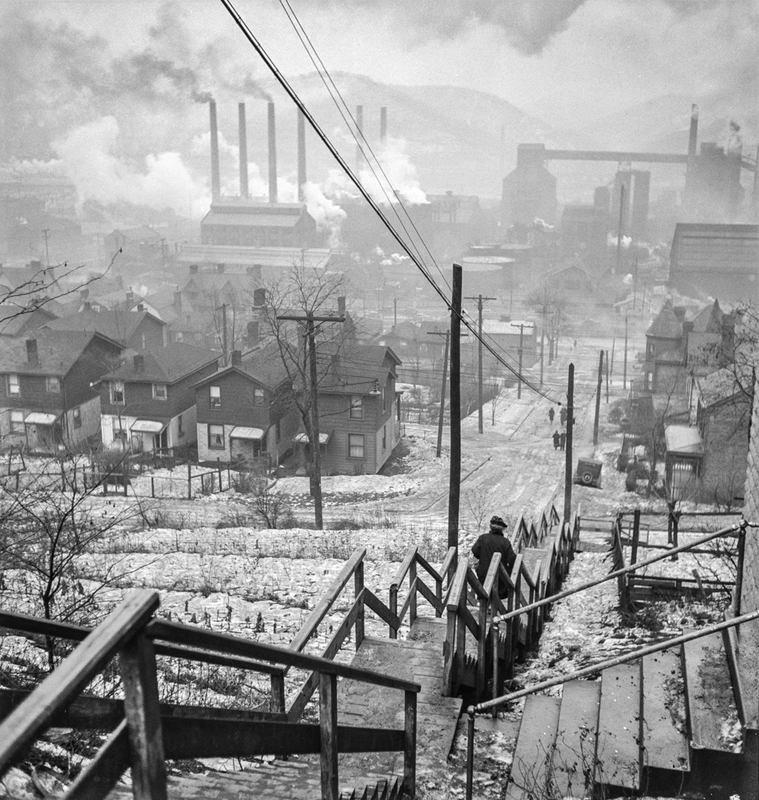 By positioning the steps in the immediate foreground, their steepness is somehow emphasised, while the enormity of the steel mills implies something to me – the hardiness of the people and their trudge to work down steep icy hills to do a tough job in the dirt and heat of the mills. Perhaps it’s these winter months that have drawn me to this winter scene and the one in my last post. Certainly, this would have had less atmosphere had it been taken in the middle of summer, when the skies were less murky, and there was no snow on the ground.